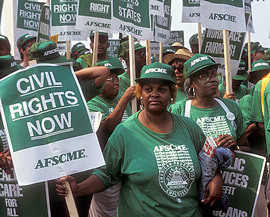 Members of the AFSCME join the AFL-CIO's "Solidarity Day" march on Washington in 1991. Private Unions: In craft unions, also called horizontal unions, members share the same skill or occupation, such as the United Brotherhood of Carpenters Industrial unions, also called vertical unions, represent workers in the same industry, regardless of their particular skill, such as the United Auto Workers. However, within the UAW workers with different skill classifications may have quite different pay levels. Public Unions: Public worker unions represent government employees and health care workers. The American Federation of State, County and Municipal Employees (AFSCME) is the largest public union. In the United States today, government workers have the highest union membership rate. As a group, wholesale and retail trade workers have the lowest rate of union membership.